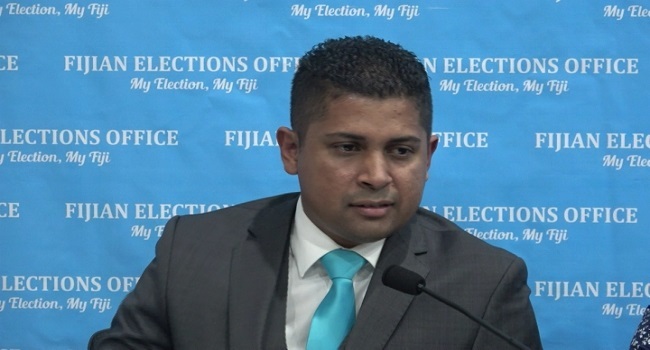 The Fijian Elections Office is expected to announce provisional results within two hours from close of poll tomorrow. Polling will end at 6pm after the last person in the queue has voted following which, counting will begin at each polling stations. However postal and pre-poll ballot papers will be counted at the national count centre. Supervisor of Elections Mohammed Saneem says provisional results will be announced throughout the night. Meanwhile, Saneem is advising the public not to fall for fake news that are continuously being published and shared on social media platforms. He adds that with their focus now on Election Day, they’re keeping a lookout on misleading information that will appear tomorrow. Saneem has also brushed aside rumors that some ballot boxes for Momi in Sigatoka have gone missing however, Momi hasn’t done polling yet adding that such talks have been designed to discredit the electoral process. Saneem is calling on social media users to stop falling for fake news as the Elections Office has the accurate data for election. Polling venues will open from 7.30am tomorrow.